Back in June, we asked if it was time to "start worrying about China's debt default avalanche" when we reported that according to research firm Rhodium Group LLC, there have already been least 14 corporate bond defaults in China in 2018, a shockingly high number for a country which until recently had never seen a single corporate bankruptcy, and a number which is set to increase as Chinese banks pull pull back from lending to other firms that use the funds to buy bonds, exacerbating the pressure on the market. As we discussed last year, as part of Beijing's crackdown on China's $10 trillion shadow banking sector, strains had spread from high-yield trust products to corporate bonds as the lack of shadow funding has choked off refinancing for weaker borrowers. Separately, Banks’ lending to other financial firms, a common route for funds and securities brokers to add leverage for corporate bond investments, has continued to decline since reaching a peak at the start of 2018, and is now down to the lowest level since late 2016. The deleveraging campaign is also depressing bond demand: “Unlike the U.S., where the majority of buyers of bonds are mutual funds, individuals and investment companies, in China, the key holders of bonds are bank on-and off-balance sheet positions,” said UBS analyst Jason Bedford, who noted that Chinese banks are buying far fewer bonds as a result. There is another reason why the traditional bond buyers have been missing from the market: according to a new report from Goldman, the threats to the Chinese bond market continue to rise with 2018 shaping up as a record year for onshore bond defaults. Neoglory Holding Group - A conglomerate from the Zhejiang province. On Sept. 25, the company failed to fully repay the principal payment on a RMB 1bn commercial paper and the put payment on a RMB 2bn corporate bond. According to Wind, the company has RMB 12.8bn of domestic bonds outstanding. Jilin Liyuan Precision Manufacturing - The company is listed on the Shenzhen stock exchange and is a manufacturer of aluminum products, based in Jilin province. The company was unable to make the interest payment on its RMB 740mn corporate bond on Sept. 25. This is the company's only bond outstanding. Gangtai Group - A conglomerate from Shanghai, the company was unable to meet the put payment on a RMB 500mn corporate bond. According to Wind, the company has RMB 2bn of domestic bonds outstanding. They also have a USD 100mn offshore bond that was issued in March this year and matures in Sept. 2019. The recent cluster of defaults has brought the number of new defaults this year to 19, surpassing the previous full year record of 18 defaults recorded in 2016. In terms of the notional amount of bonds that defaulted, it has reached RMB 91.4bn, equivalent to 0.5% of corporate bonds outstanding at the start of 2018, and 69.6% higher than the RMB 53.9bn recorded for all of 2016. 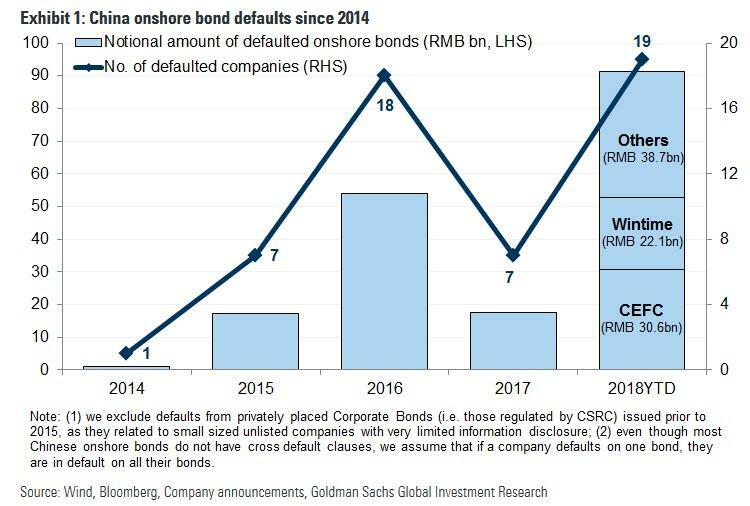 Therefore 2018 will be a record year for China onshore bond defaults, both in terms of the number of new defaults and the notional amount of bonds outstanding, as the following Goldman chart shows. It could have been worse: according to Bloomberg, Qinghai Provincial Investment Group ("Qinghai Provincial") was able to wire funds to meet the principal and interest payments on its $300MM bond due on Sept. 26. This is notable because the last minute repayment meant that a first bond default by a China Local Government Financing Vehicle was averted, as there had been uncertainties as to whether the company had sufficient funds to make the payments, as reported by Bloomberg. That said, the day of reckoning may have only been delayed for now: the company has $1.15BN of USD bonds still outstanding, of which $300MM are coming due on Dec. 11 this year. As such there is potential refinancing risks for the company going forward, and will need to be closely watched. In any case, despite the good news on the LGFV front, sentiment is likely to stay mixed as credit differentiation gathers pace. To Goldman, Chinese credit investors remain cautious due to a number of reasons, the most important of which are the lingering concerns on defaults. Meanwhile, Chinese policymakers remain determined to push through financial sector reforms, including continuing efforts to rein in shadow banking activities, and the rise in defaults over the past two months is reflective of that. As such, sentiment is likely to stay mixed, and we expect defaults to continue and there to be further credit differentiation - a trend that has been occurring over recent months given the selloff in riskier credits and the outperformance of higher-rated names. There is another potential risk: Chinese companies face 2.7 trillion yuan in bond maturities in the onshore and offshore market in the second half of this year, and together with another 3.3 trillion yuan of trust products set to mature in the second half, the funding problems will likely get worse, as already more than eight high-yield trust products have delayed payments so far this year. To be sure, Beijing will do everything in its power to avoid a default waterfall, but another emerging - pardon the pun - risk is that as negative sentiment towards Chinese corporates grows, it could become the next headwind for EM debt, even as the crises in Argentina, Brazil and Turkey appear to have settled for the time being, resulting in another significant capital outflow from Emerging Markets, and even more pained complaints from EM central bankers begging the Fed to halt its tightening, or else.